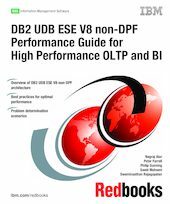 This IBM Redbooks publication provides detailed information on implementing high performance OLTP and BI applications in DB2 UDB ESE V8 environments involving AIX and Windows 2000 platforms. It is aimed at a target audience of DB2 application developers and database administrators (DBAs). We provide an overview of the architecture of a DB2 UDB V8 non-DPF environment from a performance perspective, and describe key performance drivers in OLTP, BI, and mixed workload environments. This book’s primary focus is a single partition (non-DPF) environment, and we provide best practices to achieve optimal application and system performance in OLTP, BI, and mixed workload environments. Finally, we discuss some of the commonly encountered problems faced by a DBA when managing a DB2 environment, and describe techniques for problem diagnosis using typical problem scenarios.